Sharkie, creater of her Casa Ole Green Sauce was our winner of our first Super Bowl Recipe contest. This is her recipe for the Casa Ole Green sauce. This isn’t the real recipe for the Casa Ole Green Sauce but, we all think it tastes very much like the real recipe. 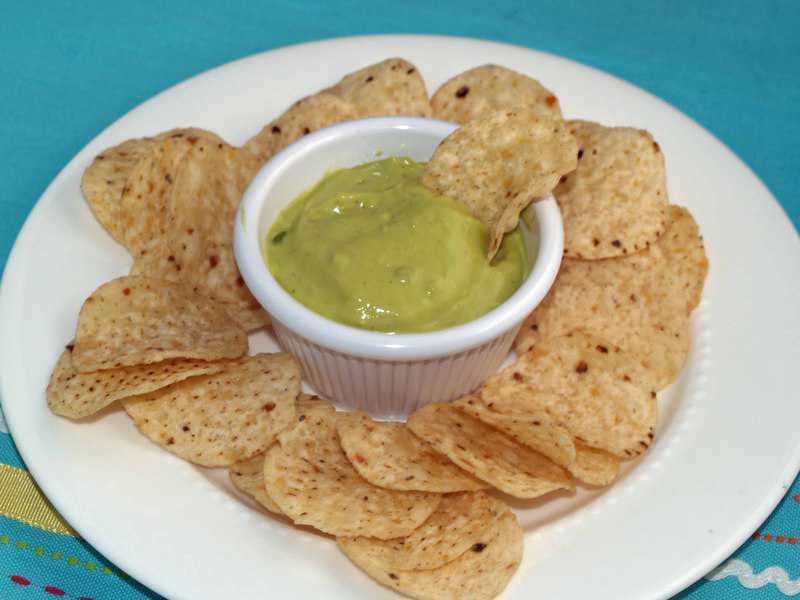 If you have never had the green sauce that is in many Mexican restaurants, it is a creamy, slightly spicy avocado based sauce. I personally have had so many bowls of this sauce, the numbers reach well above the population of where I went to high school. Are you looking for something a little different when it comes to chips and salsa? If so, try Sharkie’s Casa Ole Green Sauce. You can enjoy green sauce that tastes like Casa Ole. In a food processor combine cream cheese, avocados, lemon juice, garlic powder, salt, and sour cream, process until smooth. Add in the Rotel tomatoes, and green chilies in, and pulse several times to finish the sauce. Serve with chips. Can this be frozen in smaller batches? I personally have never tried freezing it. I would just make it fresh when I needed it. Why dont you post the recipe then? Can you please Casa Ole green sauce to me as well? Much thanks! CAn u send me the recipe please? I just made this and think it is a great, addictive dip recipe! I will make it again and again. That said, I do not think it tastes anything like Casa Ole’s Green Sauce (which I **love**!). This dip compared to theirs is too sour (I’ll omit the lemon juice next time) and too avocado-y. I don’t like avocados, but I love casa ole’s green sauce. Again, great recipe, but not casa ole at all. Forgot! Nix the Rotel and green chiles also. Actually, someone who works at Casa Ole told my daughter there are absolutely NO avocados in their green sauce. My guess is the green is exclusively from tomatillos and cilantro and the creamy is from sour cream. I seriously doubt they would use cream cheese. Nix the lemon and add lime juice instead, also white onions and use fresh minced garlic; only salt to taste. YUM! That’s odd. When we used to go there, sometimes the sauce would taste a little different. They explained it was because they got in a different kind of avocado (not Haas) because at the time there were some issues with the supply of Haas Avocados. My best friend from high school worked there for a while and he used to make it for us sometimes. The recipe he used *definitely* had avocados. I agree Tammy! I’m not sure they use avacados. I used to work at Casa Ole’ many years ago and I never recall seeing anyone make it. I believe I remember it came to us in big plastic bottles already made. Now, I don’t live in Texas anymore and haven’t had it in ages but the last time I was down there I went to eat at a place called Gringo’s and they had a similar green sauce but was way better!! It was so delicious and addicting!! They make it in huge batches…does have Avocados…ihve the actually casa old recipe from.manage 15 yra ago when I had move away….was a good friend of mine…. This is actually very untrue. As a current employee of casa olé I can tell you that one of the main ingredients IS advocados. At my location the servers are responsible for cutting them and blending them so if your green sauce is runny..The server who made it is lazy. I love that green sauce. Thank you for that tip! I appreciate it. It sounds like y’all are experts in that area. Do you know how much of everything you use? What kind of tomatoes? And how much? Missed going to Casa Ole for this stuff after leaving home in TX…..was SO happy to find the recipe (and it saved me a 1300 mile trip!). I know what you mean! Used to get some at least once a week even if it was just picking up some sauce and chips to eat at work. Now I live in Oregon and there aren’t any Case Oles nearby. LOVE this!! i used LIME juice instead of lemon juice and I added one jalapeno for some heat….SO GOOD!!! does anybody know how long this will last before going bad? a day? a week? The Sharkie’s Casa Ola Green Sauce will last for a couple of days, I would toss it after 1 week. Add some finely chopped cilantro and this nails it. Oh my GOODNESS!!! It is better than theirs. YOUR AWESOME!!!!! THIS was amazing!!! I cant wait to share it with everyone THANK YOU SO MUCH!! You should try and figure out thier queso also!!! Anyway just wanted to let you know that i usually change recipies and make them my own but my hat is off to you I cant add or take away anything!!! THANK YOU. ( I will make it hotter by using a hotter rotel) But thats it. Thanks for giving me a taste of my home town!